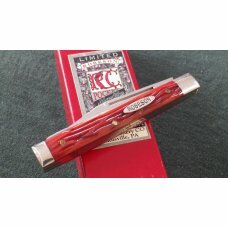 shipped fast and well protected in bubble wrap in a box with tracking..
Robeson USA 622195 Jigged Delrin Small Jack Knife - Jigged Delrin Handles - No Cracks - Nickel Silver Bolsters - Brass Liners - Snaps Open and Shut - ..
Robeson USA 622636 Strawberry Delrin Jack Knife - Beautiful Jigged Strawberry Delrin Handles - No Cracks - Nickel Silver Bolsters - Brass Liners - Sna..
Robeson Bron Bone Jack Been used & Cleaned nice old knife Brown Bone Handles are chip & Crack free Nice Half Stop , Good Snap Very Slight Wobble Blad..
Robeson MasterCraft By Queen Smooth Amber Bone Tiny Texas Toothpick New in Box never carried or sharpened Smooth Amber Bone handles with no chips or..
Robeson ShurEdge USA (by Queen Cut. Co.) Red Bone 622751 Moose Knife c.1994 - Etched "ShurEdge Trade Mark" - Beautiful Red Bone Handles - No Cracks - .. 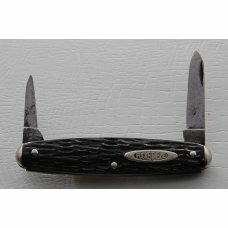 Antique ROBESON SHUEDGE Super Jumbo Easy Open Jack RARE The BIG One Robeson Shuredge, original Robeson knife made in the Robeson factory, dates to the.. 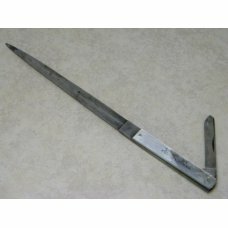 This is a vintage FISH knife that measures 4 1/2 inches in the closed position. The flat ground spear blade has a bottle opener, fish scaler feature a..
ROBESON SHUREDGE Dog Leg Jack Knife measures 2 3/4" closed. Pettern # 822850 stamped on reverse of master blade tang. Beautiful shell pearl celluloid..
MAKER: Robeson PATTERN: whittler #732105 LENGTH (Closed): 3” BOLSTERS: Nickel silver HANDLES: MOP mother-of-pearl BLADES: Spear ..
robeson Shuredge 2 Blade Jack . Been toted ,sharpened & cleaned wold make a nice EDC. 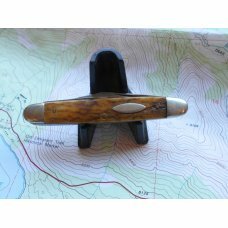 Thanks for looking..
Robeson Shuredge USA 512872 Yellow "Robeson Shuredge Frozen Heat" Etched Swing Guard Knife c.1950's - Yellow Composition Handles - No Cracks but they ..
Robeson Mastercarft Buffalo Horn Pattern # 103 . New in box never carried or shapened. Buffalo Handles are chip & crack free . etched on clip point m..
Vintage Robeson ShurEdge Rochester NY Yellow Straight Razor - Yellow Handles - No Cracks - Lightly Used with Patina - Very Nice Used Condition - No B..
Robeson Shuredge USA Genuine Mother of Pearl Letter Opener and Knife c.1950's - Beautiful Genuine Mother of Pearl Handles - No Cracks but they have so..
Robeson 2 Blade Jack Pattern # Q622056. 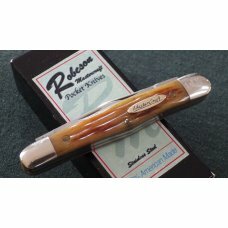 New in Robeson Box never carried or sharpen ,no wobble Pertty Bone handles with no chip or cracks. 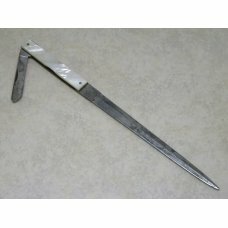 Made by Que..
Robeson Shuredge USA Genuine Mother of Pearl 722376 Letter Opener Knife with Folding Spay Blade - Etched - Genuine Mother of Pearl Handles - No Cracks..
1999 Red Bone Handle Robeson Shuedge Pattern # 622841. Never carried or sharpened . Nice red bone with no chips or cracks. No Box . Thanks for looking..
CRESCENT KNIFE WORKS on AAPK Handle - Jigged black handle scales. Length closed - 3-5/8 inches. 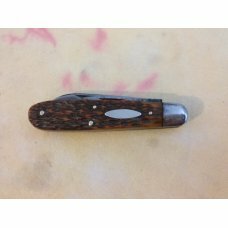 Condition - Chip and crack free, blades snap well wi..
We are pleased to offer this Robeson Vintage pocket knife in Very Good Condition. 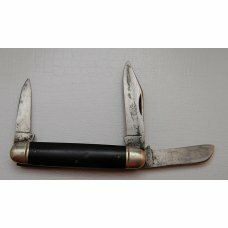 This 2-Blade 2 7/8" long pocket knife has wonderful Black Bone hand..
We are pleased to offer this Robeson Vintage pocket knife in Very Good Condition. 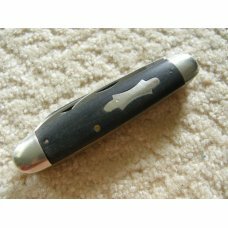 This 3-Blade 3 5/8" long pocket knife has wonderful Ebony handles a..
R.C. 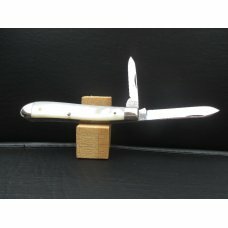 Co. Robeson Cutlery Co. Pearl 722236 Mini Barlow Knife - Genuine Mother of Pearl Handles - Rear Left Rivet Crack (Doesn't go all the way to a lin..
Robeson Mastercraft USA (by Queen Cut. Co.) Horn Stockman Knife - Etched "Robeson Mastercraft 1 of 200" - Horn Handles - No Cracks - Nickel Silver Bol..
Robeson ShurEdge USA (by Queen Cut. Co.) Bone Muskrat Knife - Etched "ShurEdge Trade Mark 1 of 100" - Bone Handles - No Cracks - Nickel Silver Bolster..
Robeson Shuredge USA (by Queen Cut. Co.) Bone Pocketeze Muskrat Knife - Etched "Robeson Tool Steel American Made" - Bone Handles - No Cracks - Nickel ..
Robeson USA 642214 Strawberry Camp Scout Utility Knife - Beautiful Jigged Strawberry Delrin Handles - No Cracks - Nickel Silver Bolsters - Brass Liner..
Robeson (MasterCraft ) By Queen, One of 200 HumpBack Whittler Pocket Knife with Beautiful Red Jigged Bone Handles. It is NOS and comes in its original.. Fantastic Robeson (Crown Jewel) Whittler with Flawless Mother Of Pearl Handles plus a Crown with Blue Stones & Gold Blade Etching as well as fancy scr..
Robeson ShurEdge USA Mastercraft (Queen Cut. Co.) Abalone Pearl #14 Peanut Knife in Box - Etched "Robeson Mastercraft 1 of 100" - Beautiful Genuine Ab..
Robeson ShurEdge by Queen Cut. Co. USA Jigged Red Bone Barlow Knife - Genuine Jigged Red Bone Handles - No Cracks - Nickel Silver Bolsters - Brass Lin..
ROBESON SHUREDGE USA 633830 Premium Stcok Knife measures 3 5/8" closed. All blades snap open and closed. 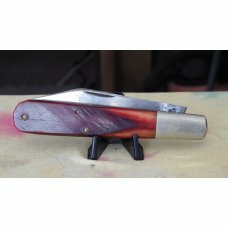 Strawberry jigged bone handles with a tight h..
Nice old Robeson Shuredge Folding Hunter Pattern 116118. Looks like ebony wood not sure has been cleaned , toted & sharpened . Blade looks close to be..
Robeson Shuredge Equal End 2 Blades Wood looks like ebony . Has been Cleaned Plenty of life left in this one Look at photo's . Thanks for looking..
Robeson Shuredge Has been cleaned and the blade apears to be short someone did a good job on this one. Pretty worm grove bone handles that are chip &..
Robeson Pocketeze Large Stag Handle 3 Blade stockman Pattern # RS49GS Exclusive 1 of 100 New in Box never carried or sharpened. Tool Steel. Nice Fat..
Robeson Shuredge USA 623480 Bone Jack Knife - Stunning Strawberry Bone Handles - Zero Cracks - Nickel Silver Bolsters - Nickel Silver Liners - Snaps O..
Robeson USA 432594 Imitation Fossil Stockman Knife - Spotless Imitation Ivory Handles - Zero Cracks - Nickel Silver Bolsters - Brass Liners - Snaps Op..
Robeson USA 643777 Delrin 4 Blade Medium Congress Knife - Alluring Delrin Handles - No Cracks - Nickel Silver Bolsters - Brass Liners - Snaps Open and..
Robeson ShurEdge Pocketeze . Peachseed Jigged Bone that are chip & crack free Pattern # 0622056. Never carried or sharpened. Thanks for looking.. 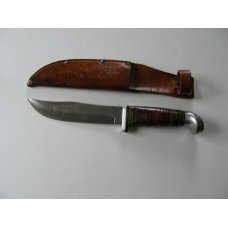 This a vintage Robeson 626242 2 blade jack with nice brown Rogers bone handles. Brass pins and liners. 3 1/2 in closed. Good snap on both blades with..
Robeson Suredge Graddaddy Barlow. Has strawberry DBone handles. The master blade is a clip point. Blade has snap in both directions. Master blade is..